My journey to becoming a horseman may differ from most. Horses where part of mother’s childhood, but not mine. While at college there was a farm nearby where you could rent a horse by the hour, with no guides. I nearly missed a few mid-terms and finals due to being out on horseback. It was a true sense of peace that even exceeded my hiking adventures. Focusing on my degree in system engineering and development I found work at the Philly race track maintaining the betting network. It was here that horses found their way back into my life for a time. Then at age 25 I moved to NC to work within the RTP tech sector. At 26 I bought my first horse and thought I was an excellent rider. My mare, being not as well rounded as the rental horses, I found I needed lessons. I found my first riding instructor, Simone Brannan, at J&H Stables. I owe it to my very green mare to starting on a very rewarding journey into horsemanship. It is working with horses that have allowed me to combine passions into a rewarding life helping horses with people problems. Since then I have devoted myself to learning and studying with some the most notable horsemen from local to international level. 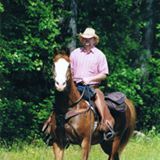 Over the years I have developed principles which are based on sound, light handed horse handling methods. Sixteen years ago my wife and I founded Collective Horsemanship to bring my principles and perspective of working with horses to the public. The goal of my workshops is for you to leave with a better understanding of how to communicate with your horse. I have worked with and learned from some of the greatest horsemen and women of our time. I have also had the opportunity to teach riders from all disciplines and worked with horses of all breeds. Over the years I have learned several truths about horses. One is that a horse never lies. The horse will be exactly as good as his human. When he has a choice, the horse will always make his own decision. And that decision will always be a reflection of you, the human. The nature of the horse is universal, no matter what discipline he is trained for or what breed he is. My Universal Horsemanship workshops are taught in an environment where the horse is allowed to express himself. Students learn about the horse’s true nature through exercises that encourage the horse to make his own decisions without restraint or force. I also teach skills that enable students to act as herd leaders to their horses. Because my students work with the horse’s nature instead of trying to control it, they have willing, happy, safe horses.